Make your own personalised hard case for the Huawei Ascend G6. Create something beautiful with your own photo or custom design. Stand out from the crowd and protect your phone with this hard case. Create and design by yourself! Did you take an absolutely amazing picture you would like to take with you and share with others? With a personalised phone case from GoCustomized you can do just that! With a hard case your phone is well protected against most types of damage your phone normally wouldn’t withstand. The case features neatly places openings to make sure all buttons and access ports remain accessible. With a high quality print on the back and the sides in a crisp black base color, your phone gets the protection it needs while looking great. NOTE: Make sure you are looking at the correct version of the G6. If you have a 4G version, this case will not fit your device. You can find the 4G version HERE. You can upload your image directly via Facebook, Instagram or your computer’s hard drive. We make sure you have the tools to create the perfection personalised Huawei Ascend G6 phone case. With our user-friendly designer module, designs can be made very easily. You just have to upload your picture and start to adjust it to your liking. Even a personalised text can be added in different fonts and colours. This gift does not only have to be for you, it can be the perfect, memorable gift. 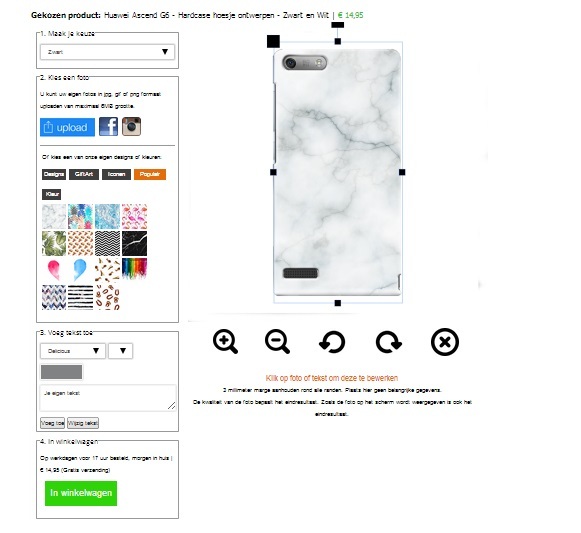 After you are happy with your design, you can of course order the case directly through our website. Fast and reliable. We will always deliver your order as fast as we possibly can. This means that your case will be printed and sent within 24 hours. The package is flat and will fit right into the mailbox. This way you don’t have to sit and wait for it do be delivered!